John Deere fabric for quilting, apparel, craft and decorating projects. Cotton, flannel, and aprons. John Deere fabrics are licensed by John Deere. John Deere Animal Toss White Cotton Fabric. John Deere fabric collection for quilting, sewing, decor..
John Deere Big Time Farm Brown Cotton Fabric. John Deere fabric collection for quilting, sewing, dec..
John Deere Blue Diagonal Plaid Cotton Fabric. John Deere fabric collection for quilting, sewing, dec..
John Deere Born to Farm cotton panel. John Deere fabric collection for quilting, sewing, decor and c..
John Deere Born to Farm Toss Cotton Fabric. John Deere fabric collection for quilting, sewing, decor..
John Deere Brown Tractor Plaid Cotton Fabric. John Deere fabric collection for quilting, sewing, dec..
John Deere Dirt Magnet Tractor cotton panel. 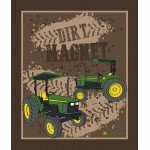 John Deere fabric collection for quilting, sewing, deco..
John Deere Dirt Magnet Tractors Cotton Fabric. John Deere fabric collection for quilting, sewing, de..
John Deere Duck Tractor Blue Cotton Fabric. John Deere fabric collection for quilting, sewing, decor..
John Deere Duck Tractor Green Cotton Fabric. John Deere fabric collection for quilting, sewing, deco..
John Deere Duck Tractor Pink Cotton Fabric. John Deere fabric collection for quilting, sewing, decor..
John Deere Excavate Gray Cotton Fabric. John Deere fabric collection for quilting, sewing, decor and..
John Deere Farm Country Cotton Fabric. John Deere fabric collection for quilting, sewing, decor and ..
John Deere Farm Fresh Pink Cotton Fabric. John Deere fabric collection for quilting, sewing, decor a..
John Deere Farm Scene Patches Cotton Fabric. John Deere fabric collection for quilting, sewing, deco..
John Deere Peace Love and Tractors cotton panel. 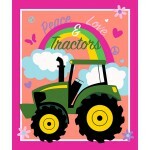 John Deere fabric collection for quilting, sewing, ..
John Deere Peace Love Tractors Cotton Fabric. John Deere fabric collection for quilting, sewing, dec..
John Deere Proven Power Cotton Fabric. John Deere fabric collection for quilting, sewing, decor and ..
John Deere Square Plaid Tractors Green Cotton Fabric. John Deere fabric collection for quilting, sew..